Play Video Get A Quote! Modern Pest Services is a third generation family-owned and operated pest control company. Established in 1945, it has been a leader in the industry from its beginning. Modern employs integrated pest management (IPM) practices in all operating activities and offers commercial and residential pest control services. This includes traditional and thermal bed bug treatments, various wildlife services and year-round protection for your home and business from as many as 60 pests. I've used this company three times for various problems and the service has always been great, with friendly and helpful personnel. They are not inexpensive, but you get what you pay for. Hi Steven! Thanks for the 5-star review! We're happy to hear you've had a good experience with Modern. Have a great weekend! Due to the snow left around my home, the outside portion of my service could not be completed. The inside was done, great as always.. We will need to schedule for the outside to be done later on.. my issue is that I will be billed for completed service now, not when it is rescheduled and completed. If I forget to reschedule, it won't get done, just paid for. Please advise. Other than that, the service agent for your company always does a great job. thanks, Dennis Goddard Winterport, Maine. Hi Dennis! Thanks for the great review. I have alerted our communications team about your situation, and they will reach out to you soon. Have a nice weekend! The service is fairly effective we are very pleased with the results and your service personal are excellent , so thank you fore your service and for caring about satisfying you clients and providing an effective service. Hi Mazouz! Thank you for taking the time to write us a 5-star review! We're happy to here you've been pleased with Modern! This was the second time I met Branden and I was absolutely confident in his ability as well as his professionalism. He was personable ,efficient and was prepared to do what was expected of him. I do have one question.Will you take my comments to heart or is this another form request from your company ??? Modern Pest responds quickly and is a big help when we have infestation problems at any of our apartment buildings. I would recommend them highly. Hi Janice! We're so happy to hear you've been pleased with Modern's communication and service. We appreciate the great review! Enjoy the snow and stay safe! Excellent, professional, prompt, and friendly service. Hi Garth! Thanks so much for the excellent review! We're happy to hear you've had a good experience with Modern. Have a great week! 4 times a year service instead of this 3 times a year. I've been on the 3 times a year service for a year now and I prefer the previous method. I love my technician she is very thorough and knowledgeable. But, I live in northern Maine and have a very bad mouse problem which has been dramatically reduced with the services I receive from Modern Pest but, this year I noticed that there were still mice getting in from the woods at the back of our house and this would not have happened if the 4 times a year of service would have still been in place. Thank you for letting me express my felings. Hi Anne! Thanks for the 5-star review! We're happy to hear you've had a good experience with your Service Professional, Jocelyn. I have asked Kelly Gaudet, the Service Manager at the Bangor branch, to reach out to you to discuss the tri-annual service. Thanks again for the great feedback! Great Job. Employee walked through snow/ice to treat property. Hi Stephen! Thanks for the great review! Trudging through snow is definitely part of working in Maine! Modern Pest is absolutely amazing ! We used to have problems at home (in town Bangor) with rats and mice in the walls. Since their bait stations went in, the rats and mice have totally disappeared. More than this, Modern Pest plugged all the cracks and entrance points for rodents. The sprays also keep spiders and bee infestations from becoming a problem...old home attracts these insects. They do such great work, I hired them to maintain my professional office building as well. Modern Pest....well worth the small monthly expense. They physically come to your property periodically and provide the appropriate up-keep. 5 out of 5 stars. Highly recommended ! Hi Adam! Thanks so much for the amazing review! We're happy we can keep your home and business as [pest-free as possible. We appreciate your great feedback! The technician was thorough, well trained and did an excellent job in relating information to us. We look forward to working with him again. Hi Rhonda! We're so happy to hear you had a good experience with your Service Professional and with Modern in general. Thanks for the great review! Modern pest has been thorough in their pest control activities. Very often the techs have gone out of their way to address concerns and to answer questions, including crawling under the deck to find small holes where mice were getting in. Thanks. Hi Dave! We're happy to hear our Service Professionals are doing a great job. Thanks for the 5-star review and have a wonderful weekend! Hello! It's great to hear that you're having a good experience with Modern. Thanks for the 5-star review! This keeps popping up I've already reviewed you folk several times please don't ask me again. Hi James. We have removed you from this mailing list. Sorry about that. Have a great week! Thanks for being responsive when we have a problem. Hi Judith! We'll always try our best to be there when you need us. Thanks for the great review, and Happy New Year! The Technician who comes out to our place is very knowledgeable. He explains the different bait stations, always answers our questions, and gives very welcome suggestions on what we can do with our garden areas and house to help exclude the critters! Hi Deb! Thanks for letting us know that your Service Professional James did a great job. We appreciate the great review! We couldn't be happier with your service. The service man was very polite and helpful-thank you. Hi Faith! We're happy to hear you're pleased with Modern's service, and that you had a good experience with your Service Professional, Ryan. Thanks for the great review! We have had two technicians assigned to our account in the past 5 years. Both of them are knowledgeable, professional and courteous. They know their craft and they proceed in a way that is cognizant and respectful of our business. The service is excellent. Hello! We're so happy to hear that you've had a great experience with your two Service Professionals over the years. We appreciate the great review! Enjoy your weekend! Very good service and always accommodating to our needs. Hello! Thanks for the great review! We're happy to hear you've been pleased with your service. Since we started with mosquito spraying we had a drastic reduction around our pond and home! Thank You, and see you next year. The McGuinness family. Hello McGuinness family! We're so glad our Vector service worked well for you this summer, and it's great that you'll be sticking with us next year! Thanks for the great review! Took care of the problem. Hi Jim! We're happy to hear that your problem has been taken care of. We're always here if you need us. Thanks for the great review! Staff is very pleasant and accommodating!! Hi Sarah! We're happy to hear you've had a good experience with Modern Pest. Thanks for the great review! Hi Isaac! Happy to hear you've been satisfied with your service. We appreciate the feedback! Person showed up on time, was courteous and efficient. Price was actually less than estimate. Hi Weslie! Thanks for the great review! We're happy to hear you had a good experience with Modern. Enjoy your week! Everything was great! The lady who came was very helpful and friendly! Hi Louise! Glad to hear it went well and that your Service Professional did a good job. Have a great week! Hi Janet! Thanks for the great review. Have a nice weekend! knowledgeable and did a great job. Thank you. Hi Frank! Thanks so much for the 5-star review. It's great to hear that you had a good experience with Modern and your Service Professional! Peace of mind now that the carpenter ants and friends are gone and going. Hi Cheryl! Thanks for the great review! We're happy to hear about your success with the carpenter ants. Let us know if there's anything else we can do. Have a great weekend! Just The Best! 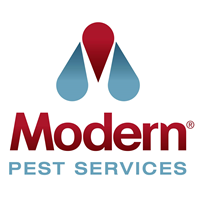 Have used Modern Pest Services for at least 15 or more years. VERY HAPPY!!!!! Hi Mary! Thanks for the great review, and thanks for being a part of Modern Pest for 15 years! Have a great weekend! modern pest services do one heck of a job. Hi Gina! Thanks for the great review. We always appreciate hearing how we're doing. Have a great week! Dave does a great job at our seasonal camp in Washington county...He is very thorough and very pleasant.... Miles Theeman. Hi Sarah! Thanks for the 5-star review. Have a great week! Hi Patricia! Thanks for the great review. We're happy to hear you've had a good experience with Modern. Have a great weekend! Excellent response time, quiet professional service. Highly recommended. Hi Robert! Thanks for the great review. We appreciate your feedback. Have a nice week! Hello! Thanks for the great review. We really appreciate your feedback. Have a nice weekend! Hi Bob! Thanks for the review. Have a great weekend! I left a review recently. Thanks so much for the 5-Star review! We appreciate it! Excellent service. Modern Pest was timely, efficient and extremely helpful with our squirrel problem. I would certainly call then again if I needed the same or similar services! Hi Rob! Thank you for the great review. While we hope you don't have any future squirrel issues, we will be here to help if you do. Have a great weekend! Excellent service and good people to work with. Modern are very nice people to deal with. They are there when scheduled, quick to do their job, helpful with any questions you may have.